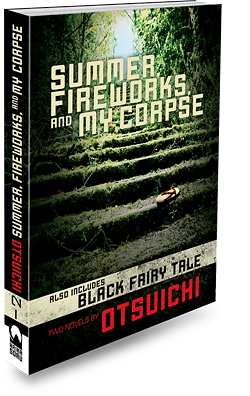 ﻿ SUMMER, FIREWORKS, AND MY CORPSE « Haikasoru: Space Opera. Dark Fantasy. Hard Science. Two short novels, including the title story and Black Fairy Tale, plus a bonus short story. Summer is a simple story of a nine-year-old girl who dies while on summer vacation. While her youthful killers try to hide her body, she tells us the story—from the point of view of her dead body—of the children's attempt to get away with murder. Black Fairy Tale is classic J-horror: a young girl loses an eye in an accident, but receives a transplant. Now she can see again, but what she sees out of her new left eye is the experiences and memories of its previous owner. Its previous deceased owner. Summer, Fireworks, And a Sale! Report from Japan: Meeting Otsuichi! Summer, Fireworks, and Fabulous Prizes! Two new books! OH MY! Born 1978 in Fukuoka, Otsuichi won the Sixth Jump Short Fiction/Nonfiction Prize when he was seventeen with his debut story "Summer, Fireworks, and My Corpse." Now recognized as one of the most talented young fantasy/horror writers in Japan, his other English-language works include the short story collection Calling You, the Honkaku Mystery Award-winning novel Goth, and the collection ZOO (Haikasoru 2009). “Don’t be like that,” the taller one replied. “I mean, that girl…What was her name? Satsuki, right? I know she was probably kidnapped, but…doesn’t something about this area strike you as odd?” He gestured at a section of the forest—right in the direction of my body. Ken’s mind was racing. What did he see? That ditch should have been completely hidden by the dirt, like just another part of the forest. But the boy’s face remained confident. Ken hadn’t thought of the consequences of wearing cleats to climb down the slope. He kept silent as he listened to the two detectives talk, but his eyes began to work back and forth as if he were measuring something in his mind. Disregarding his partner’s lack of interest, the taller man walked over to where I was hidden and stooped down to inspect the dirt.